I am sitting here watching the NFL playoffs and remembered that I never posted my final post about my portable station build. I completed the build last year. I say completed, but of course that does not rule out future modifications. I am a ham after all right? There are two antenna connectors on the left for the FT-857D, one for HF and the other for VHF/UHF. The HF jumper actually is connected to the antenna tuner and there is another jumper goes to the radio. 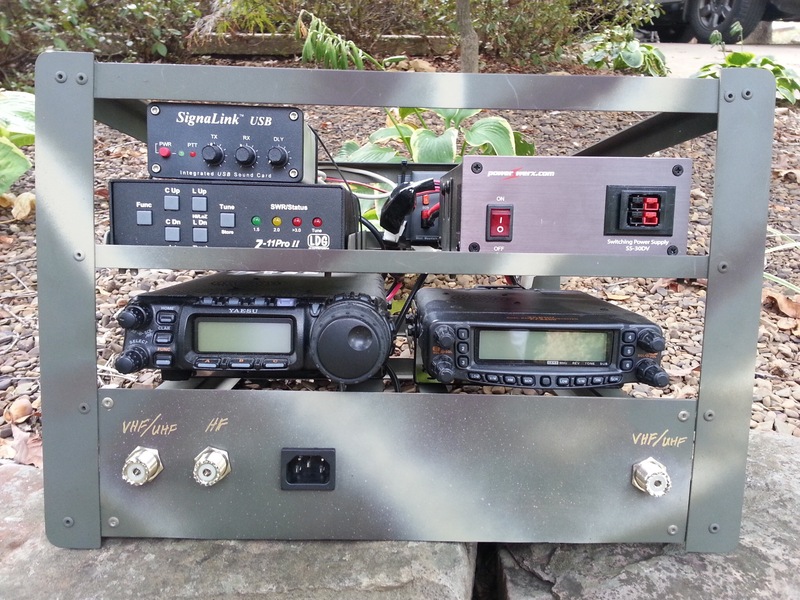 There is also a VHF/UHF connection on the right for the FT-8800R. The power connector I salvaged from a computer power supply and made a power cable that plugs into the Powerwerx power supply. The last picture is the setup in action at Field Day. 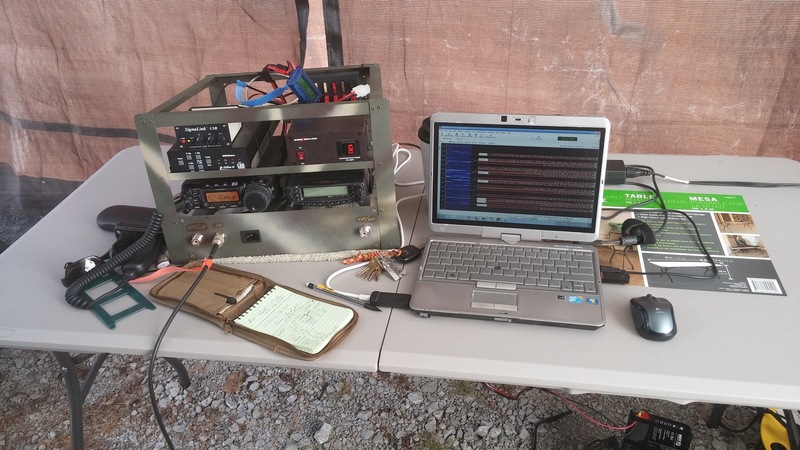 I was running PSK31 with my club on 20m and had a good time. You can see that the radio on the left is running and there is no power connector in the front. In this picture, I have a 35 amp/hour battery under the table feeding power into the RigRunner mounted in the back of the rack. I was able to run low power digital modes all day and into the night. I still had power left over when I went home. I have been happy with the rack that I built. Lately I have thought about splitting the radios apart into their own rack as I have found that I don’t use both at once usually. There are also events where I need just the FT-8800R and don’t need the HF gear. Having the FT-857D along for the ride does give me a spare radio if something were to malfunction with the FT-8800 during an event I suppose. So for now, this is the result.